1. 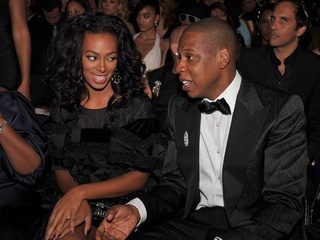 Solange and Jay Z's elevator fight breaks the Internet. It's the kick that launched a thousand tweets. A grainy elevator video shows Solange attacking Jay Z while Beyoncé looks on and does nothing. The three-minute fight has prompted endless speculation as to what could have caused such rage. 2. This is what Star Wars would look like if it were a Tarantino film. It's amazing what a difference background music and bubbly graphic type can make. Changing the original cast to include Uma Thurman, Tim Roth and Harvey Keitel doesn't hurt either. 3. Macaulay Culkin wears a T-shirt of Ryan Gosling wearing a Macaulay Culkin T-shirt. Sure, it's probably just a marketing ploy for Macaulay Culkin's bizarre band The Pizza Underground, but we can't stop from clicking on it, and neither should you. There's so much to unpack here. The shirt-on-shirt-on-shirt image is a mind bender, and then there's the incredibly odd backdrop to dissect as well. 4. If your dog could text. Any self-respecting dog owner has tried to imagine what thoughts are going through his four-legged friend's head. And because we all prefer text to actual conversations, these hypothetical text messages ring true. 5. Texas Rangers second baseman makes catch with his shirt. Rougned Odor just got moved up from the minors, and he's already making headlines. The Venezuelan-born baseball player snagged a ground ball in a most unusual catch during the sixth inning against the Houston Astros on May 12.